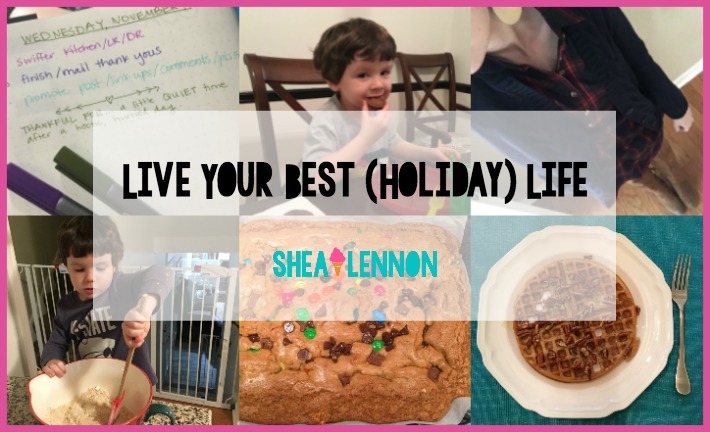 It's Monday and it's the second week of our Live Your Best (Holiday) Life for Less challenge! Thanks to everyone who has been participating so far; I've loved seeing your posts on Instagram. - Started gratitude log in bullet journal. - We said things we're grateful for at dinner. - Shopped my closet for a Friday date look. - Welcomed Thanksgiving and said goodbye to Halloween by baking some candy bar cookie bars. November 6 - Plan to give back with your family this month. During the holidays, our church does "Joy in Serving" which gives lots of opportunities for serving here in the Kansas City area. One of the things we always do is pick up a gift bag and buy Christmas gifts for a child in need. Violet is still a little young to understand, but this year it will be great to get Jona involved in picking out gifts for someone else. November 7 - Schedule 30 minutes of reading. Sometimes reading time gets pushed to the back burner, especially when there are so many other things going on. However, I always feel better when I take a few minutes to read. Since I'm a morning person, I plan to start my day with 30 minutes of reading, before anything else can get in the way. 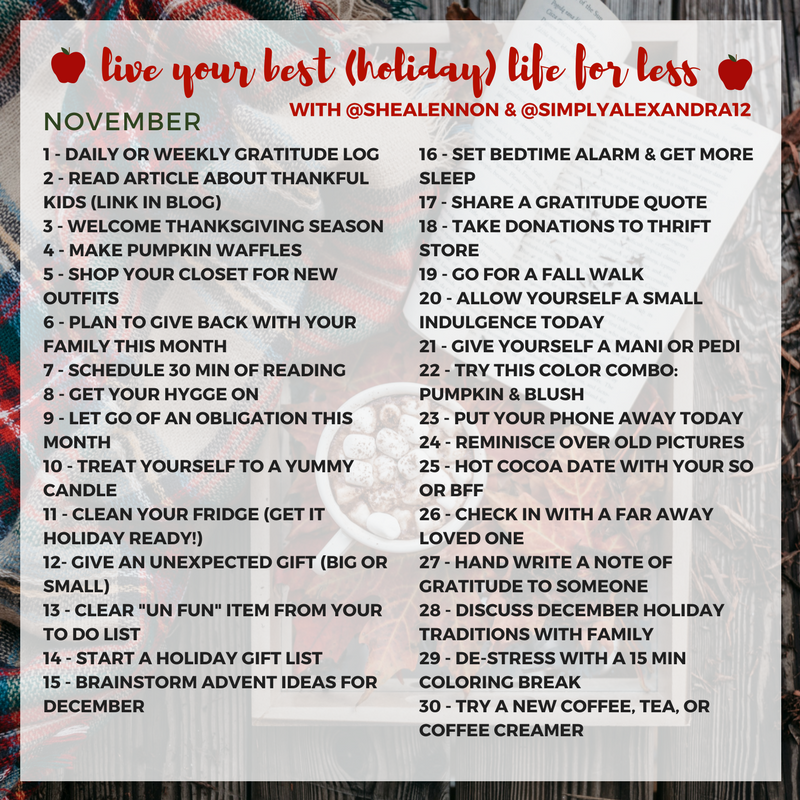 November 8 - Get your hygge on. I admit that I don't know a lot about the concept of hygge, other than that it's a Danish word that loosely means "cozy". 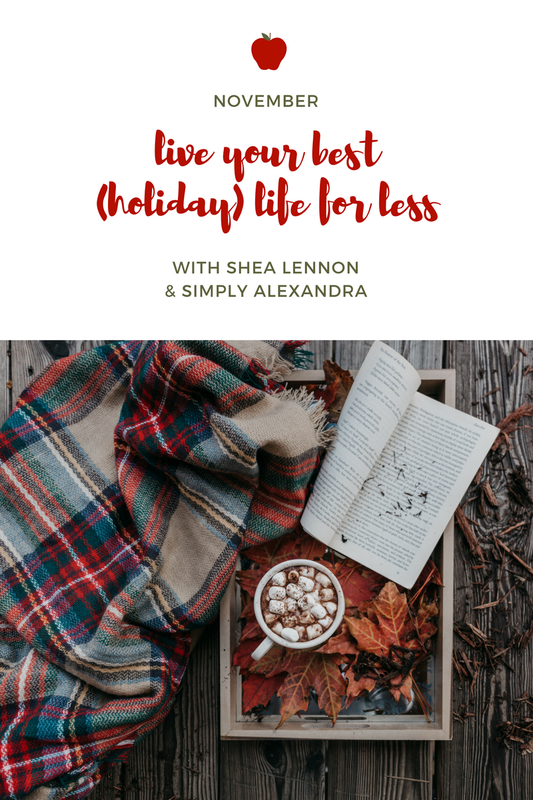 I'll have to check out Alexandra's ideas on this one, and maybe pick-up The Year of Living Danishly or The Little Book of Hygge for more inspiration. November 9 - Let go of an obligation this month. This one is hard for me. My to do lists are always long, and then I feel like I need to check everything off. However, I do need to practice letting things go. Right now I can't think of one specific obligation I need to let go of, but I could do a better job of lowering my expectations for what I can reasonably get done in a day. So maybe I can let go of the idea of completing my to do list every day. November 10 - Treat yourself to a yummy candle. A new candle is an inexpensive way to make your house feel a little cozier and more festive. I love scents like apple, cinnamon, and vanilla this time of year. November 11 - Clean your fridge (get it holiday ready!). So this may not be the most fun thing to do, but I know my future self will be pretty happy I did. November 12 - Give an unexpected gift (big or small). Doing something to cheer someone else up always makes me feel good too. Maybe I'll buy coffee or a donut for a coworker, or pay for the person behind me in line. Since I love to bake, I could also give some baked goods to a neighbor or friend. I don't think I could go wrong with any of these things. We'd love for you to join us and tag your posts with #LYBHolidayL. Have a great week!